Tata’s First Electric Car, Tigor Rolls Out; 100% Electric Cars In India Soon! With this, Tata Motors has officially jumped onto the electric vehicles wave, and things get exciting from here! Few days back, we had reported Tata Nano’s production has dropped to just 2 per day, and how it signifies the death of a car brand which Ratan Tata so ambitiously launched few years back. However, when one door closes, another one opens. The best example is Tata’s Tigor electric car, which is their first electric car to be launched in India. This way, Tata Motors has officially jumped onto the electric vehicles wave, and things get exciting from here. Tata’s First Electric Car Tigor EV: The Reason For Roll Out? Energy Efficiency Services (EESL), which is an entity under Power Ministry, had floated a tender for procuring 10,000 electric sedans, which will be used to replace all Govt. vehicles. This was world’s largest contract for manufacturing electric vehicles, anywhere. Tata Motors was the lowest bidder, and under the same contract, they have just rolled out the first batch of Tigor EV (Electric Vehicle), and handed over to EESL. 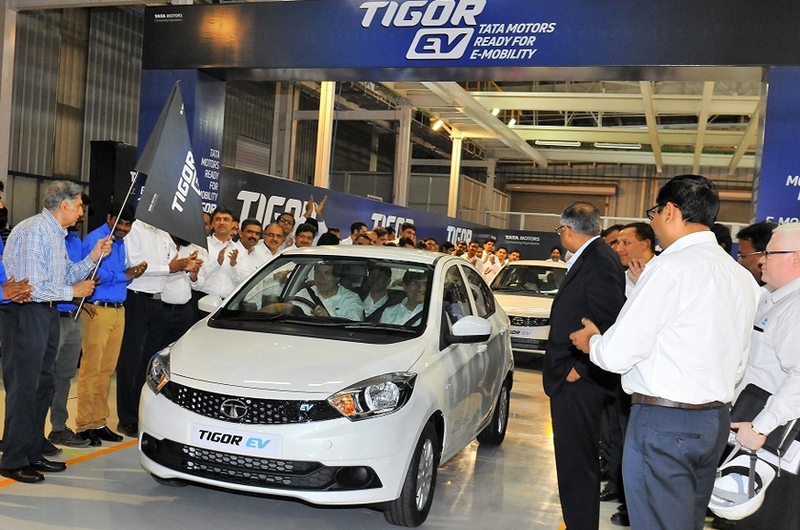 250 Tigor sedans have been now given to EESL, which will be used to ferry Govt. babus and Ministers, thereby signalling a new era of electric mobility in India. These cars will be manufactured at Tata Motors’ Sanand plant, the same plant where Nano is being currently made, albeit just 2 per day. Interestingly, Tata Motors have acquired the complete electric driving mechanism from Electra EV, which is a company that deals in electric powertrains and battery packs. This is the same company which is providing powertrains to Jayem Motors, which are currently manufacturing a modified, electrified form of Nano, which would be widely used as cabs in coming months, by Ola and Uber. Mahindra & Mahindra, which is India’s oldest electric car manufacturing firm, has received order of 150 sedans by EESL. In the first phase of 10,000 electric vehicles contracted by EESL, 500 would be delivered in the next 6 months. Within this 500 count, 100 will be delivered by M&M; and the test by Tata Motors. Tata Motors had bid Rs 11.2 lakh per electric car cost, which was Rs 2.35 lakh lower than what M&M had bid, thus winning the bid. Govt. has already announced their ambitious plan to stop all fuel-based cars in India by 2030, and replace them by electric cars. However, some analysts have questioned this 100% electric car dream, terming it as unfeasible. But, gradual progress is being made. 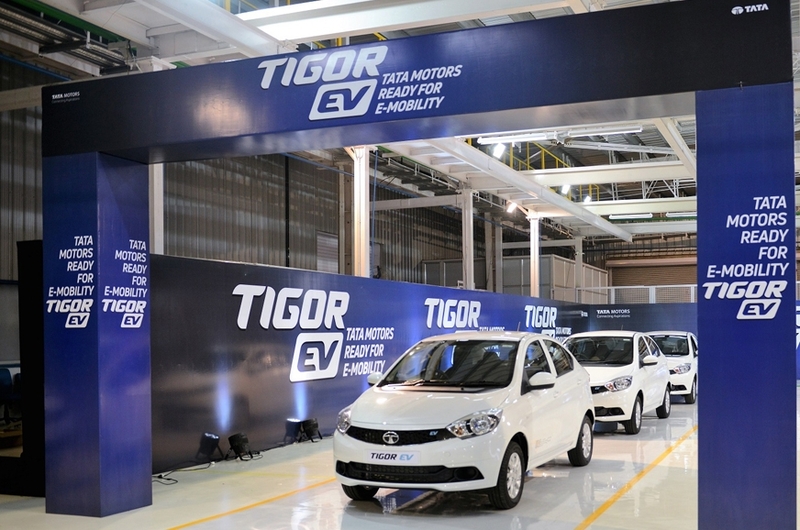 Both Tata and Maruti, India’s largest car manufacturers have showed immense interest in the electric car segment, as visible by the fast launch of Tigor. Besides, Maruti has also committed investment of Rs 3900 crore to manufacture electric cars in Gujarat. Even ISRO is making 100% Make in India (Solar) Electric-Hybrid cars in India, and the mood is upbeat. Will the market adapt to the new reality? Do share your comments right here! "Tata’s First Electric Car, Tigor Rolls Out; 100% Electric Cars In India Very Soon! ", 5 out of 5 based on 7 ratings. How much does the car cost, and how much is it to charge it up, per km?